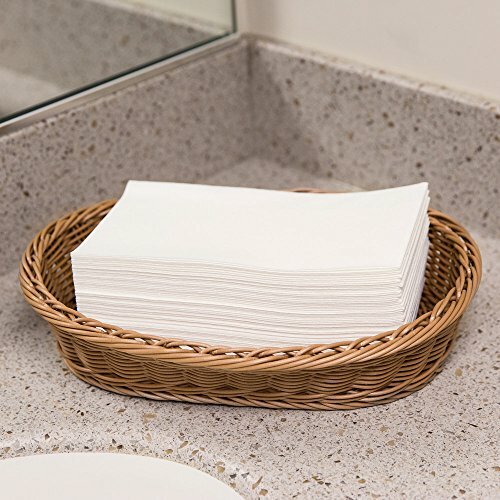 Using paper hand towels in your powder room can be a great solution if you have a large number of guests since they allow you to offer the hygiene of a clean towel to each guest. The cloth-like feel of a quality paper towel also gives your guest bathroom a touch of elegance and luxury while making your guests feel welcome in your home. Look for nice texture in good quality paper towels. Some have the touch and feel of “real” hand towels. 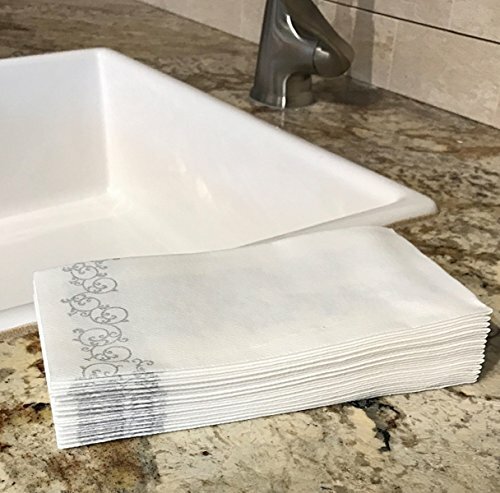 If you’re looking for a quick recommendation, our pick for all-around best paper hand towel are these Silver Collection Linen Feel Disposable Hand Towels (check the price on Amazon) but we’ve also included a few other detailed reviews below to pick from. By supplying your bathroom with nice quality paper guest towels, you also avoid the unpleasant experience of your friends going to dry their hands on a towel at a party and finding a clammy towel is already damp from being used over and over by other guests. If you are hosting a busy party you don’t want to be stressing out about the bathroom. You won’t necessarily have time (or want to worry about) changing out your regular bathroom towels often enough to keep it fresh and clean. As an added bonus, thick paper hand towels also give your guests an easy and convenient way to tidy up after themselves. 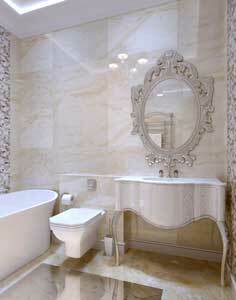 A quick wipe down of the vanity here and there will go a long way to keep the powder room looking clean. Many guests are actually pleased to find paper towels as it gives them a way to leave it clean (especially if there are other people waiting to use the bathroom) as it avoids the self-conscious feeling of leaving a messy bathroom at a nice party. BloominGoods Guest Towels are paper but almost feel like linen. These paper towels are slightly off white. The color difference is only noticeable if you place them on pure white tiles and really isn’t a major drawback. The towels feel thick when you pick them up and really do match up to the linen-like you’d expect from a quality guest towel. They are very durable, even surviving being used to scrub your face or even to clean-up the sink or counter-top. The towels are lint-free so will not shed when used, leaving your guests picking bits of paper off their hands all night. The only real downside to these towels is that they are not as absorbent as you might hope. They are sufficient for drying your hands, but they won’t do much with a spill. They’re actually nice enough quality that you can dress them up as wedding napkins like this. These plain white paper towels by Silver Collection are on the smaller size at 15” x 15”. As they are very thick and durable their smaller size does not impact on their function. 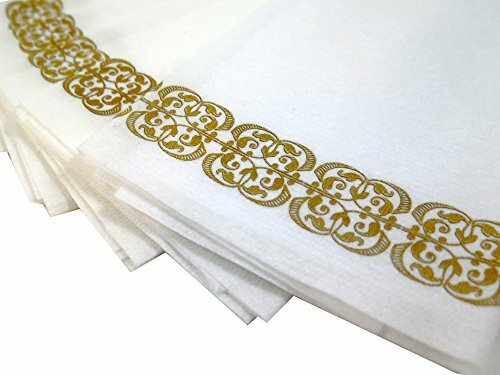 The quality of the material is very good and they have a silky texture to them rather than just plain linen, which makes them feel rather more decadent than other similar paper towels. Despite the soft feel, the towels have some structure to them which means that they do not just ball up in your hands as you are using them, they have the right amount of stiffness to facilitate drying your hands while maintaining a pleasant texture. 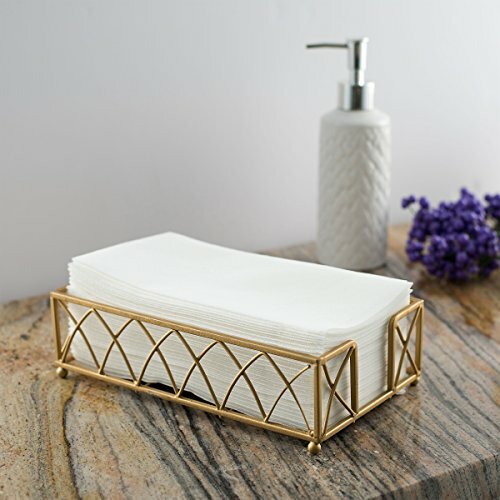 These lovely white hand towels feature a delicate floral pattern around the edge, in either gold or silver, which means you can select the towel that will best match your décor. The downside to the design is that it does show through to the back side, which gives the impression that the towels are thinner than they in fact are. It is just a reflection of how deeply the dye has been absorbed. These towels are very absorbent, as shown by the dye from the pattern! They are very at absorbing a great deal of water and are better than most paper hand towels in this respect. The feel of these is akin to silky linen and they are pleasingly thick. The towels come in a box that has a tear away section meaning they can be stored in the box and still easily accessed which is an advantage over some other budget options that come in a cheap plastic sleeve that makes the unused towels hard to keep organized. The box could be used to dispense the towels if you are more concerned with function than form. Appearance gives the first impression that they will be too thin and less absorbent than they are. These plain white paper towels by Magnifiso are thinner than some of the alternative options but they are also a good cheaper option. The towels are soft to touch and are quite durable. They are very absorbent without becoming soggy which makes them very practical to use. They are lint free so will not leave fibers behind when used which means they are also really good for cleaning mirrors without leaving streaks behind. The major downside with these towels is that they come as a large stack that is only held together by a clear plastic sleeve. Once you remove the sleeve there is nothing to contain the towels so they can be somewhat difficult to store. These hand towels from Gmark are not linen, but they do feel like one. These napkins are designed using only premium quality materials and advanced technology to conform to the standards set by the industry. The quality of these napkins is checked thoroughly on various parameters. Gmark linen-feel hand towels are perfect for use during meal time – they have the right amount of thickness to absorb moisture and wipe off residue. And because these napkins are disposable, cleaning up is much easier. You can throw them out safely because the materials used in this item are eco-friendly. Gmark designs their towels so that it looks stylish and trendy but without compromising the quality. You’re essentially avoiding laundry, which means you get to save your own money and water as well. You can use these towels at home and for events like anniversaries, weddings, birthdays, and housewarming. It’s also perfect for kitchen use, catering, nightclubs, bars, as party decorations, restrooms, hotels, and restaurants. With this Guest Linen Decorative Hand Napkins, you’ll forever say goodbye to damp hand towels. These pretty hand napkins are disposable but they feel luxurious in your hands. They look and feel like linen, so wiping your hands with it won’t feel rough and coarse. Guest Linen napkins are designed with gold floral trims on the edges, but they don’t just look pretty –they are thick and durable too, in fact, twice as thick of regular multifold tissues. You only need one piece to your dry your hands. You can use these decorative hand napkins in both casual and formal occasions, be it parties, birthdays, engagements and weddings, graduation, wine tasting tea, gatherings, or anniversaries. You are also helping the environment because these hand towels are made of eco-friendly materials. 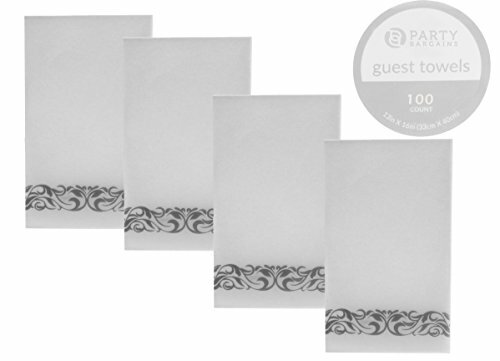 Guest Linen Napkins are also perfect for bulk use, such as in buffet settings or restaurants. Your guest will feel extra special with these smooth, disposable paper towels. When unfolded, Party Bargains napkins measure 13 x 6 inches, perfect for your hand-drying needs. These paper towels also prevent cross contamination to ward off the spread of infectious diseases. Compared to other paper hand towels, these ones from Party Bargains are more efficient to use due to its quick-drying material. It’s hassle-free and hygienic, and saves time since you don’t have to wash your towels – simply dispose of them. And you don’t have to worry about adding trash to the environment either. These are made of environmentally-friendly materials. You can use these towels for regular days and on special occasions such as parties and formal occasions. At dinner time, you won’t have to scramble for clean towels since these provide the solution. Party Bargains paper hand towels are made with premium quality materials and are good value for money. Scott Towels has made a name for itself as a brand that delivers performance and quality without breaking the bank. Their products help everyday consumers save time and money with innovations like the C-fold towels, which are very budget-friendly. This is a good option for small businesses or offices that go through a high volume of paper towels. The folded design also makes them very compatible with dispensers, although they can also be used at home in a simple holder. 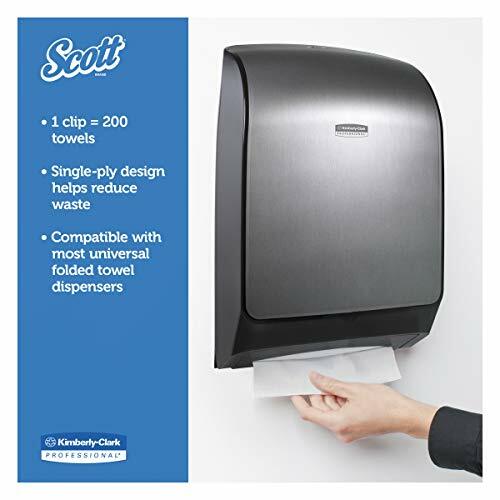 Scott C-Fold Paper Towels are one of the best choices if you want an effective but economical hand-drying product. Each paper towel is recycled and designed with Absorbency Pockets that ensure efficient drying. 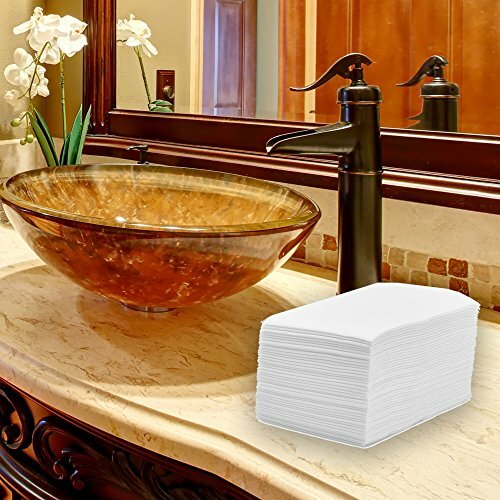 Getting these paper towels for your home will give your bathroom and cleaner look, and you and your family and guests will always have something to dry your hands on. These napkins come in just the right size so that it’s not too big when you unfold them, therefore reducing waste. You’ll only need a single towel to dry your hands, meaning you won’t have to refill frequently. Scott C-Fold Paper Towels reduce bacteria by up to 77%. This is an eco-friendly product that’s certified by the FSC and EPA. If you are looking for some additional tips and tricks to make your guest bathroom as stylish and welcoming as possible you might find this short video useful. At the beginning of the video, you’ll see on the vanity that they are using paper guest towels in a metal tray with silver accents. At the 3 min mark or so she explains the reasons why she goes with paper napkins (basically the same reasons we do: hygienic, avoid the damp communal towel and give the feel of luxury). At that point of the video she also shows how she uses a small amount of this Scotch Removable Adhesive Putty to keep the paper hand towel dispenser in place…very easy and smart tip! Packaging – If you are buying a large number of hand towels then you will need to consider how you will be storing them. Some packs come with packaging that can be opened up so that it is easy to dispense the towels but still keeps them contained and easily manageable. The paper towels that are provided in plastic or paper sleeves, can be difficult to store, as if the stack gets knocked over they will just scatter everywhere. Branding – Some paper towels come with the company name embossed or printed on to the towel. If you are going for an elegant look this can detract from the effect you are going for, we would avoid these in general but especially if being used for a guest power room. Shape and Size– Most paper towels are 12” by 17”. This makes a good-sized hand towel that will be large enough for all your guests. Some hand towels come in 15” by 15”. The square napkins can feel a little smaller and as they are square they do have a different look to them. Color – If you are planning to use these paper towel in an elegant setting then the color is an important consideration. If you get off white towels for a white bathroom they will just look dirty. Plain white is the most common option, but if you want something a little different that are patterned options available as well. There are actually some very unique and colorful designs available, like this wide selection on ebay. Multifunctional – If you are planning to use these towels as more than just hand towel then you may need to decide on how important the durability and absorbency is. 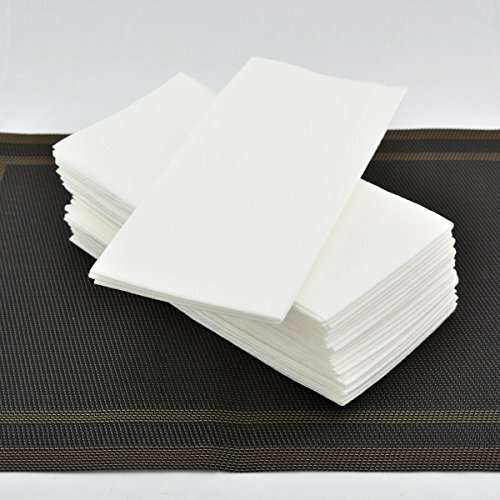 If you are planning to use these as paper table napkins then you might be better selecting a towel with higher absorbency, so that they can be used in the case of spillage. If they are going to be used for cleaning as well then durability will be the more important consideration. If you are looking for inspiration, here are some photos on Pinterest all kinds of different paper towels for guest bathrooms. While all of our picks above are available on Amazon, you may also want to check out other paper towel options at Bed Bath and Beyond or Target. If you are looking to add a touch of elegance to your guest bathroom, you may want to check out these luxury bath accessory sets and these luxury rainfall showerheads can give your guest shower the feel of a spa in your own home. If you are looking for a good all-purpose hand towel that you are primarily going to be using in a powder room then you can’t go wrong with the Silver Collection Linen Feel Disposable Hand Towels as they have a clean look and quality feel. If you regularly entertain people and want an elegant and hygienic option for your guests. Whether you are having guests at home or need quality paper towels for a bathroom at a professional office or small business these towels are good quality options without breaking the bank on a disposable product.